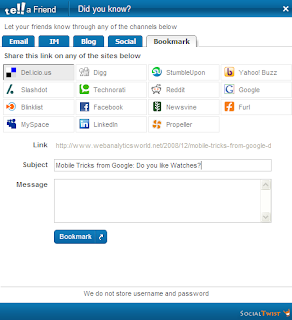 I love the new blog widget by SocialTwist called Tell-A-Friend. It's a pretty slick way for my readers to share content via email, instant messenger, social networks and bookmarks. SocialTwist supports numerous platforms, so the implementation was pretty simple - it even worked for Classic Blogger (which is what I use on my personal blog). The Tell-a-Friend service works in most blogging platforms and popular Content Management Systems (CMS). Currently supported platforms are: Wordpress engine, Wordpress.com (free accounts as well), Blogger/Blogspot, TextPattern, JRoller, TypePad, Movable Type, Drupal, Joomla, Pligg, Mambo, and OSCommerce. Email: GMail, Yahoo! Mail, MSN/Windows Live Mail, Type Email Address. IM: Y! Messenger, GTalk, MSN/Windows Live Messenger, AIM. Hey this is really nice can't wait to start using it. Seems simple. Keep in mind Manoj is a writer for Search Engine Guide so he doesn't have any control over what tools the owners use. thank you.. The Tell-a-Friend service works in most blogging platforms and popular Content Management Systems.. good work..